Japan will build India's first bullet train under a sweeping tally of agreements made following talks in New Delhi Saturday, deepening a partnership Prime Minister Narendra Modi said would "shape the course of Asia". The Indian premier spoke warmly of his friendship with Japanese Prime Minister Shinzo Abe and the power of their political alliance, after agreeing deals on the $15 bn high-speed train, defence technology and civil nuclear cooperation. Both Modi and Abe are right-wing nationalists and economic reformers who have forged an unusually close relationship since the Indian leader came to power last year, partly to counter China's growing influence. "I cannot think of a strategic partnership that can exercise a more profound influence on shaping the course of Asia and our interlinked ocean regions more than ours," the Indian prime minister said after the talks. "Our remarkable relationship also has a wonderful human touch." The leaders of Japan and India, Asia's second and third-largest economies, promised to use their alliance to push areas of mutual interest including reform of the UN Security Council, on which both are seeking permanent seats. They also agreed a memorandum of understanding on the peaceful use of nuclear energy, which will be signed once technical details have been finalised. The long-mooted agreement is expected to allow Japan to export nuclear plant technologies to the subcontinent. Japan has in the past shunned civil nuclear cooperation with India, which has not ratified the international Non-Proliferation Treaty, but appears to have softened its stance. 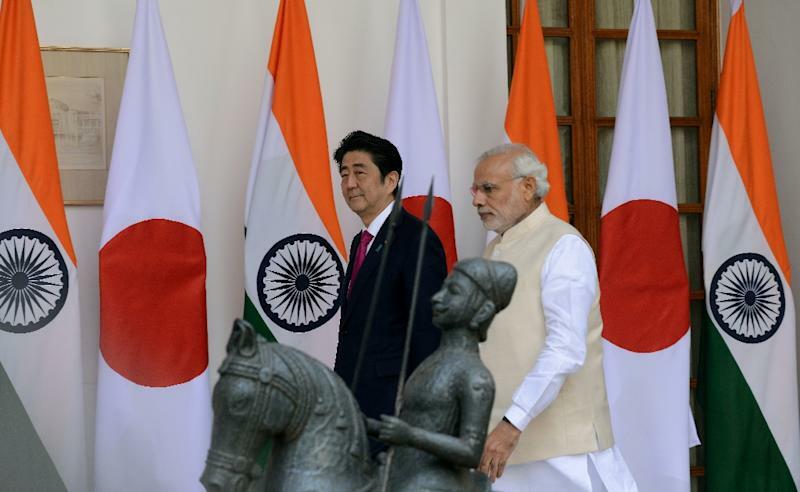 The announcements came after Abe lavished praise on Modi's 18-month-old premiership following a meeting with business leaders in the capital. "Prime Minister Modi's economic policies are like Shinkansen -- high speed, safe and reliable while carrying many people along," he said. Later on Saturday, the pair arrived in India's holiest city of Varanasi, which is also the premier's parliamentary constituency, adding a note of cultural exchange after Modi visited Japan's historic city of Kyoto last year. Pictures showed Indian workers laying orange and yellow floral garlands to decorate the banks of the River Ganges, as police boats filled with security forces patrolled its waters ahead of the leaders' arrival. The new bullet train will slash journey times between the Indian cities of Mumbai and Ahmedabad, reportedly from eight hours to about two hours. "This enterprise will launch a revolution in Indian railways and speed up India's journey into the future," said Modi, who has pledged to overhaul India's ramshackle railways and other infrastructure. Tokyo will provide India with a $12 billion package of financing and assistance for the train, including a low-cost, long-term loan. Other agreements signed Saturday included stepping up the transfer of defence equipment and technology, with possible future projects including Japanese-made seaplanes. Japan will also be made a partner in the Malabar Exercise, a naval drill conducted annually by the United States and India, to help counter "maritime challenges" in the region, the leaders said. Japan has taken part in the previously bilateral exercise for the past two years, a move seen as reflecting closer military ties that are seen as a counterweight to growing Chinese influence in the region. "China has its activities in East China Sea, South China and is known for its border transgressions," Srikanth Kondapalli, head of East Asian Studies at Jawaharlal Nehru University in New Delhi told AFP. "So the Japanese and Indian leaderships finally said 'we are fed up with this, we have to work on stability of the region, in Asia at large,'" Kondapalli added. India will also extend visas on arrival to Japanese citizens from March 2016, including for business travellers. Modi, who hopes to attract foreign investment under his key Make in India campaign, lauded the recent decision by Japanese-owned carmaker Maruti Suzuki to begin the first exports of Indian-made cars to Japan. Tokyo is encouraging Japanese businesses to tap fast-growing emerging markets such as India, as the domestic market shrinks due to a rapidly ageing population and low birthrate. India's economic growth accelerated to 7.4 percent in the second quarter of the financial year, figures released in November showed, outperforming China.